As smartphone technology improves and audiences continue to turn to social media to get the news, publishers are experimenting with video formats and using mobile journalism techniques to produce short-form content in a more time-efficient way. Leonor Suarez, television journalist at Spanish regional public broadcaster, Radiotelevisión del Principado de Asturias, has taken this concept one step further, producing an entire 50-minute history documentary using her smartphone. The piece, called "Time to revenge", was filmed and edited by Suarez in her spare time. It tells the story of a soldier who fought for the Republicans in the Spanish Civil War, who escaped being killed by the Nationalists after his side lost, living until he was 97 years old. "I chose to use my skills in mobile journalism to produce the documentary, as it allowed me to shoot and edit the whole story myself – free to tell it how, where and when I wanted," she said. "His personal story is not well-known, but a lot of people living in Asturias are still personally affected by the war 80 years on, so I felt this it was an important issue to explore – which I was able to do using basic mojo kit." Using just an iPhone 6S Plus, wireless microphone, tripod and the Filmic Pro app, Suarez filmed a variety of things, from interviews with the soldier's relatives and historical experts, to dramatical re-enactments of the events of the time from professional groups. "When I was with the re-enactment actors, it was just me and my iPhone, directing, producing and filming twenty people – quite stressful at times," she said. "I had to run around deciding on the best angles, double-checking the sound as well as that Filmic Pro was recording all the time, because it can be risky." But Suarez, who won the 2016 Thomson Foundation Mobile Journalism Award for her work covering Bolivian mines, noted that as the equipment was so light and portable, she was able to closely film the action, following the actors during their scenes and quickly alternating between different kinds of shots which would have been more difficult to set up using bigger stabilisation equipment. 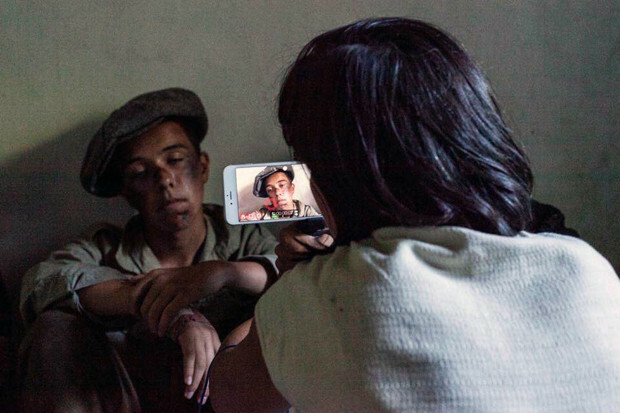 For every scene of the documentary filmed, Suarez ensured to always take a master wide-shot as well as close-ups, which she explained is vital when shooting and editing longform stories and documentaries on mobile devices. "Every day that I filmed, I always had to download my footage to my 256GB iPad to clear space – the limited capacity meant I had to shoot little by little, which took more time, but it's just how it goes when filming on a mobile." In total, Suarez spent six days filming the historical documentary, which she then went on to edit using the app iMovie on her iPad. It is due to be broadcast on Radiotelevisión del Principado de Asturias next month, and will be available online, where Suarez is also planning to have it translated to English. "Mobile journalism gives everyone, including journalists, filmmakers and documentary makers, the ability to produce quality visuals on a low budget," she said. "I funded it all myself, made possible by the portability and quality of the smartphone in my pocket."